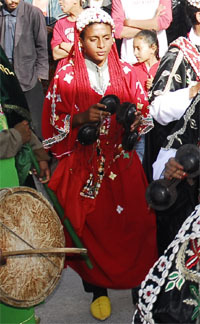 Morocco's gnaoua (or gnawa ) tradition is the music where Arab and black sub-Saharan Africa meet. With its special mix of African magic and Islamic rituals. 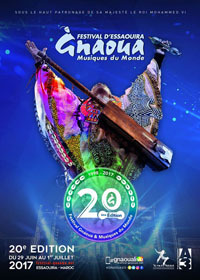 Gnaoua rituals combines both music and acrobatic dancing to create trance and healing. 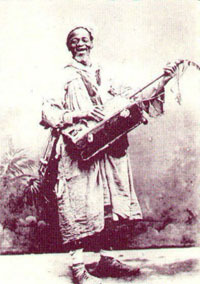 The Gnawa religious brotherhood are the descendants of West African slaves who were brought northward (Guinea, Mali ) but they claim their spiritual descent from Bilal al-Habashi, the Ethiopian who served as the Prophet Muhammad's first muezzin, a person who calls the Muslim faithful to prayer. 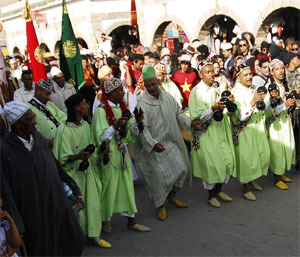 Musicians parading in the medina on the opening day of the Gnaoua Festival. is hold every year in June. 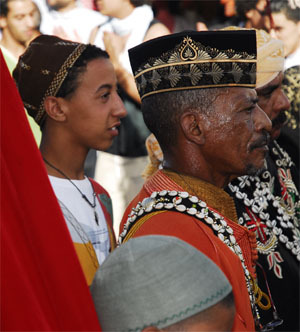 Especially in the Muslim month of Sha'aban, which is just before Ramadan, there are "leelahs" held in the gnawa community. Their ecstatic dances remind of the voodoo cult. 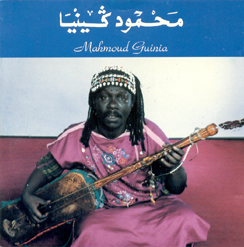 Gnaoua music has a great socio-psychological importance, as it is supposed to heal diseases. The tradition of Gnaoua music dates back to the 16th century, when Sudanese slaves were brought to the Haha territory (an Berber tribe). They worked at the sugar factories. 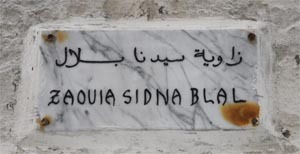 In 1760, with the construction of the harbour and the medina, Sidi Mohammed Ben Abdallah brought a lot of Black slaves from Senegal, Sudan and Ghana to Essaouira. Their songs tell about the painful march through the Sahara desert and the sufferings of slavery “Ouled Banbara”.A part of the Gnaoua of Essaouira comes from the Senegalese of the colonial times. In the west lives the Gnaoua (Sidna Bilal). Some of their ancesters had worked with the construction of the town in 18th century.Others came here vy the Tombouctou caravanes or was enrolled by the French army in the beginning of the 20th century, They animate the rites of possession, organize moussems(The month of Chaâbane) and go for pilgrimage to Moulay Brahim on the Mouloud. Another black brotherhood is the Ganga, in the east, named after the big drum .Most of the Ganga did work on the Saadien sugarplantations during the reign of Ahmed Al Mansour 16th century. The grande caids in the region of Essaouira had about 400 black.slaves. 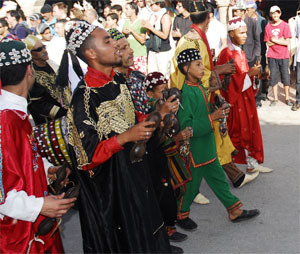 In Morocco, a Gnaoua group always consists of the master (maâlem) and the musicians. The instruments they use are the guembri, a long lute with three strings, the qarqba, large, metal castanets and the tabal ("ganga"), a cylindrical, wooden drum. The name gnaoua (gnawa) appears to originate from the Saharan Berber dialect word aguinaw (or agenaou) , meaning "black (men). This word in turn is possibly derived from the name of a city significant in the 11th century, in what is now western Mali, called Gana, in Arabic Ghana or Jenna and in Portuguese and later French Guinea or Jenné. the musicians invoke the entities, the «mlouk» or «melk»(sing.)." The Gnaoua Brotherhood (Zaouia of Sidna Bilal/ Boulal) reside in the Zaouia, which is located in the west part of the medina, Bni Antar. Three years after arriving in Tangier, Cohen produced the now classic one-shot magazine Gnaoua in 1964. According to his introduction: “GNAOUA after Black African sect in Morocco known for ecstatic dancing and procession trances...Each spirit which possesses the dancer has a specific gesture and musical phrase associated with it. The object is EXCORCISM.” Gnaoua was a reflection of the expatriate Beat community in Tangier with which Cohen was associated. Its contributors included William S. Burroughs, Ian Sommerville, Brion Gysin, Harold Norse, Allen Ginsberg, Michael McClure, J. Sheeper (Irving Rosenthal), Jack Smith, Stuart Gordon, and Alfred Jarry (translated by George Andrews). The archive comprises all aspects of Gnaoua’s production, including artwork, manuscripts, correspondence, mailing list, plates, and proofs. 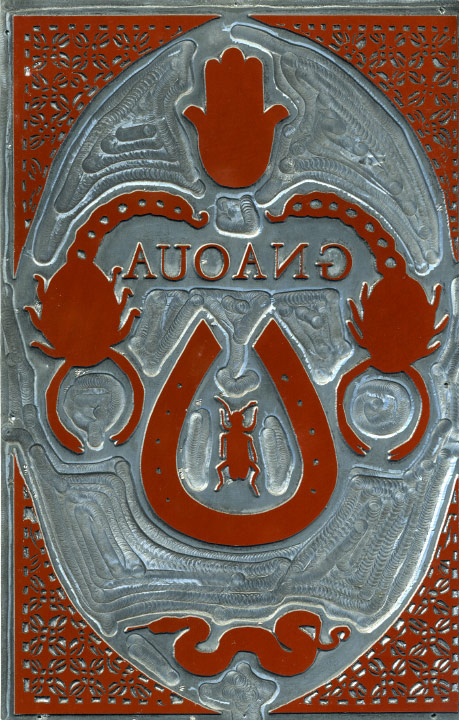 In 1964, Cohen visited Amsterdam on route to Antwerp to arrange the printing of Gnaoua. While there, he met the Dutch poet, writer, and “lifelong hippie” Simon Vinkenoog, who would become a close friend and translator of Cohen’s poetry. Cohen’s Gnaoua Press published The Founding Pig by Aymon de Roussy de Sales in 1966 (included in the archive is a copy of the book inscribed by the author, along with the mock-up containing original artwork of the entire book), and the underground classic The Hashish Cookbook (1967) by Panama Rose (Rosalind Schwartz). 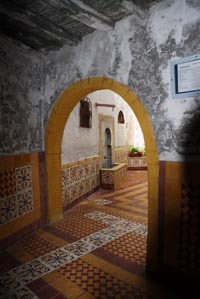 While living in Tangier, Cohen met Living Theatre member and writer Mel Clay. The two experimented making cut-ups together. It was through Clay that Cohen formed his close relationship with The Living Theatre that resulted in his living and traveling with member Petra Vogt and producing Marty Topp’s film, Paradise Now: The Living Theatre in Amerika. In 1968, Cohen was arrested and fined $10 for obstructing a police officer trying to shut down The Living Theatre at Yale University. 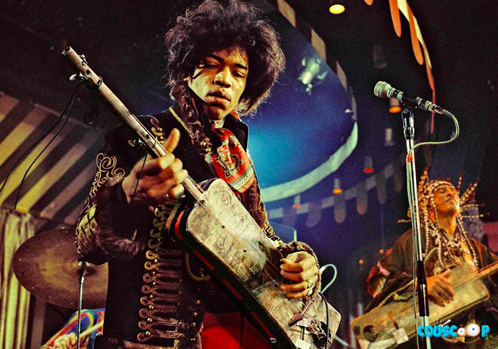 and he is a legend and many myths about Jimy Hendrix is a vital part in Essaouiran culture. Read more about what is thrue about it here.